Star Ruby Grapefruit from California? Absolutely! Sure, the Star Ruby was originally from Texas, but now we grow them here in the great San Joaquin Valley of California. 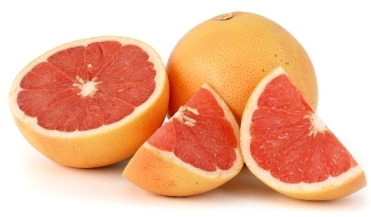 With a beautiful ruby red "blush" of color when you open them up and a sweet and delicious grapefruit flavor when you taste them, these "gems" will soon be the "star" of your breakfast table or your anytime nutritious snack. With only 60 calories per serving (1/2 grapefruit) and of course always fat and cholesterol free, ruby grapefruit are packed with 100% of your daily requirement of Vitamin C! Try star ruby grapefruit in cool refreshing salads, by themselves, or get creative in the kitchen by using them in a marmalade or compote. And don't forget you can even juice them for a drink with all the flavor and health benefits you could ever ask for in a piece of fruit. People say the stars a little brighter in the summer time, and with Star Ruby Grapefruit from Pearson Ranch in your kitchen, they just may be right.